The growth of Office 365, a successful turnaround, or outright sale could reward shareholders. 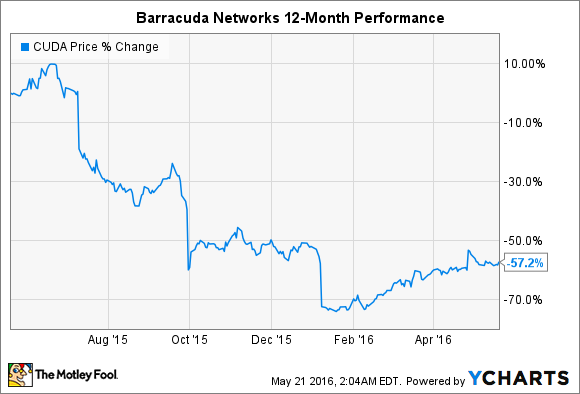 The last 12 months haven't been kind to Barracuda Networks (NYSE:CUDA) investors. Shares of the cybersecurity company have lost almost 60% of their value since last May, with a series of disappointing earnings reports having taken a toll on the company. More recently, however, Barracuda Networks has shown signs of turning its business around. Strong quarterly results in April helped propel the stock, and over the last three months Barracuda shares have risen more than 35%. Several catalysts could send shares even higher. Here are three that investors should watch for. Barracuda could benefit from the success of Microsoft's (NASDAQ:MSFT) cloud business. Office 365 Enterprise, Microsoft's cloud-based, subscription-based alternative to its traditional software suite, offers business customers online email service through Outlook.com. Demand for Office 365 has surged in recent years, and Microsoft had more than 70 million monthly active users as of the end of last quarter. That's up from around 60 million in September 2015. Barracuda has a strong relationship with Microsoft, and the company is uniquely positioned to benefit from the growth of Office 365. Barracuda offers an email protection service aimed specifically at Office 365 customers. Known as Barracuda essentials for Office 365, management identified it as one of the company's three focus areas going forward during the company's April earnings call. With Barracuda essentials, businesses that use Office 365 for their email can turn to Barracuda for security. If demand for Office 365 continues to grow, Barracuda shareholders could benefit. It's never wise to invest in a company strictly on the possibility that it could be acquired. That said, Barracuda is an obvious takeover target. In February, Bloomberg reported that Barracuda's management had retained bankers to explore a possible sale. Investors could benefit if a larger security or IT company scooped it up, preferably at a healthy premium. Some analysts have bought into the story. In March, BTIG upgraded Barracuda shares, slapping a buy rating on the stock with a price target of $20. BTIG cited the company's strengthening fundamentals, but also declared it a "prime takeover target" (via StreetInsider). It's difficult to say who would want to purchase the firm, but the company's increasing focus on a particular niche -- providing cloud-based IT security -- could entice some buyers. But so long as it remains a stand-alone company, Barracuda's performance is likely to be driven by its operating results. Those results could be dictated by the success of its ongoing transformation. Barracuda's management is currently working to refocus the company, shedding some non-core businesses in the process. Barracuda ended its Barracuda drive service on May 1, for example, and is currently exploring options for other product lines it defines as non-core. In April, Barracuda warned that ceasing these operations could hit its revenue in the near-term, but its more narrow focus could ultimately pay off in the long-run. In addition to targeting Office 365 customers for email protection, Barracuda is also looking to provide network and application security, as well as data backup and cloud archiving. It hopes to become the premier vendor for these services among small and medium-sized businesses. Barracuda posted stronger-than-expected revenue and earnings last quarter. That trend could continue if its transformation succeeds.